Homeowners frequently call with concerns about cracks in their concrete foundations. Cracks in foundations result from several different causes: concrete shrinkage, settlement of the soil, and over-loaded foundations. Cracks in foundations are best diagnosed and resolved by a contractor who specializes in foundation repair and reinforcement. Such contractors have much more experience in soils and drainage than structural engineers and have the tools to measure which portions of the house have settled more than others. If you are interested in having cracks in your home’s foundation assessed we recommend that you first contact Al Lind of the Al Lind Company at 206-941-1777. Al specializes exclusively in foundations and has been in the business for decades. He has really seen it all. Concrete foundations that do not have steel reinforcing bars (rebar) inside are much more likely to crack than concrete with rebar. In addition, the cracks in concrete without rebar will likely be much wider than cracks in concrete with rebar. If the concrete is reinforced with rebar, the cracks are typically less than one-eighth of an inch. A majority of the shrinkage of the concrete occurs within three months after it is poured. Concrete is a mixture of water, cement, sand, and gravel. As the concrete dries, the loss of water reduces its volume, and thus the concrete shrinks. When one section of concrete shrinks in the opposite direction of another section of concrete, cracks form. The most common location to find a shrinkage crack in the foundation is about halfway along each side of the house. Shrinkage cracks are typically vertical cracks. If the concrete pour has a high water content, then shrinkage cracks are more likely to occur because a large volume of water must exit the concrete as it dries. For that reason, structural engineers, on their structural plans, usually recommend a maximum water-to-cement ratio and instruct the contractor to refrain from adding water to the concrete pour. The concrete supplier has a very specific design mix for the concrete and it is their job to add the appropriate amount of water: not the on-site contractor. 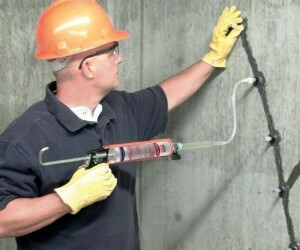 If the contractor would like the concrete to flow more easily, a compound called a superplasticizer can be added to the concrete mix by the concrete supplier. Superplasticizers should not be added by the general contractor on site: they must be added to the concrete mix at the concrete factory by the concrete supplier. Thus, the contractor must make that request in advance. Settlement of the soil can be caused by a number of factors: inadequate compaction of the soil during construction, decomposition of organic materials in the soil, ground-water movement, poor stormwater drainage, and proximity to a hillside. When building a house, the contractor must compact the soils at the locations of the new concrete foundations to increase the soil’s bearing capacity. However, geotechnical engineers typically indicate that, in spite of the soil compaction efforts, the soil under the foundations may settle up to an inch or so, and that some areas under the foundations may settle up to half of an inch more than other areas. Most settlement occurs during construction due to new load of the weight of the house. When one area settles more than another area, cracks can occur in the concrete foundations. These cracks caused by differential settlement can be either diagonal or vertical. In the greater Seattle area, the bottom of foundations are required to a minimum of 18” below grade. The goal of this 18” depth is to set the foundations below the depth at which the ground could freeze during winter. In addition, most of the organic material in the soil is located in the top 18” of soil, so this depth also prevents most houses from having settlement problems caused by decomposing organic material. However, when large trees and bushes are removed from a site, their remaining roots may extend under the foundations and thus settlement can occur when the roots finally rot. On some homes, foundations extend below the ground surface by only a few inches. Such footings are much more susceptible to settlement due to organic material, rainwater softening the soil, and erosion. Groundwater refers to the water below the ground surface that we cannot see. Groundwater movement can transport soil away from your concrete foundations causing settlement. The most common cases of settlement that we have seen caused by groundwater movement is the settlement of the concrete driveways, walkways, and even the concrete slabs in the interior of garages. We have seen several cases in which the garage slab has dropped several inches due to groundwater movement because the house’s backyard is lower than its front yard. Many older houses do not have drain lines next to their foundations: drain lines that would move water away from the foundations. Such drain lines are often referred to as ‘French Drains.’ During a storm, surface runoff and groundwater will flow against the side of the foundation, creating a rush of water along the foundations. This concentration of water can pull soil away from underneath the footings causing settlement. The most common place to find foundation settlement is near a downspout. The downspouts are the vertical pipes that drain the roof gutters. Inevitably, the joint between downspout and its sub-grade drainline leaks and the soil erodes. Many houses’ downspouts do not have a sub-grade drainline: the downspouts just drain their water right next to the foundations. For houses without drainlines, ‘splash blocks’ are commonly sold in stores to divert the downspouts’ water away from the footings. However, splash blocks only move the water a couple feet away from the house: that distance may not be enough to prevent erosion of the soil from under the foundations. We recommend that you should consult a drainage contractor or a Civil Engineer to determine the best solution for creating a drainage system around your house. This may be the most effective way to control settlement of foundations. Houses located on or above a slope will inevitably experience some soil settlement. In some cases, such houses like experience slow but steady settlement over decades. On a hillside, gravity, groundwater movement, and stormwater will, over the decades, pull the top layer of the hill downwards. This phenomenon is known as ‘creep’. Some hillsides experience rotation in which a deeper layer of the soil slips, and a large volume of the hill shifts downward. Improving your drainlines alone will not resolve this issue. For engineering solutions to stabilize your house on a hill, contact a Geotechnical Engineer. Alternatively, to help stabilize the hillside with plantings, contact a Landscape Architect or the City Arborist: they can recommend plants with dense root systems that will prevent erosion. They call also inform you about which plants and trees to avoid because they add a lot of weight to the slope but not much stability. The typical older home has a perimeter foundation that consists of a 6” thick concrete wall above a 12” wide footing. However, in some cases, the 6” concrete wall does not have a wider footing: the 6” wall bears directly on the soil. In cases like this, settlement is more likely to occur. In addition, many older homes have undersized footings under the interior posts of their crawlspaces and basements. Thus, it is common to find that the floors are sloped toward the interior of the house.